When it comes to traveling with toddlers, you can expect things to get a bit turbulent. But with a few tips and tricks we’ve learned along the way, it can easily be a fairly smooth (dare we say enjoyable!?!?) experience. I always arrive at the airport wondering if my child going to be helpful and eager to please? Or will he go into full toddler mode and meltdown in the middle of the airport while I’m saddled down with two heavy bags, a car seat and dwindling patience? Honestly, even on my most prepared trip, I’ve had both experiences. That being said the risk is worth the reward. My kids are some of my favorite travel companions, but flying with a toddler requires some thoughtful planning and it begins with the booking process. 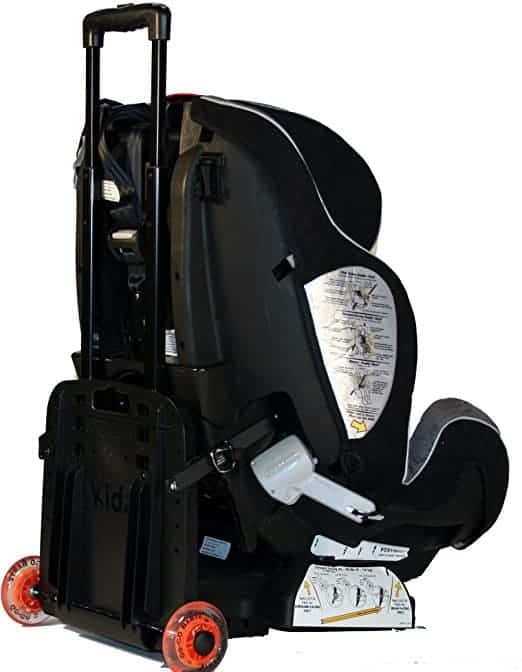 It can be tempting to just check the car seat but I recently discovered that bringing the car seat is worth the hassle of lugging it through the airport. Especially if you get yourself a Carseat Travel Stroller. This guy is a life saver, it converts your car seat into a little stroller to wheel it (and your kid!) through the airport. It then folds up to store under your seat. Car seat experts will tell you it’s safer to have your child fly in a car seat, it’s also better for your car seat to not be checked. While this is true, the icing on the cake is that your child already has respect for car seat etiquette. They know when they get in the car seat they won’t be getting out until travel has stopped. This is not the case for seats on the plane. There is suddenly too much temptation. Especially once that fasten seatbelt sign turns off and they take “you’re now free to move about the cabin” to heart. Another perk of the car seat? Built-in cupholders for you and them! Lastly, they’re just plain comfortable. Who wants to sit in an airplane seat with you can have built-in head and feet rest? Note: You will need to make sure that your car seat is approved for use on aircraft. In my experience, the larger convertible car seats like my Graco Extend2Fit are most often approved while booster seats (even with 5 point harness) are not. Check the warning labels on your car seat and be prepared to show them to both the gate agent and the first crew member you run into on the plane. In my 8 years of traveling with kids, I have made choosing the right seats a science. Here are a few do’s and don’ts. Do pay the fee/check in early to select your seats. It will be worth it. Don’t sit near the engines. While they are conveniently located near the restrooms they’re also noisy. Which means any electronics you bring on the plane need to be louder. 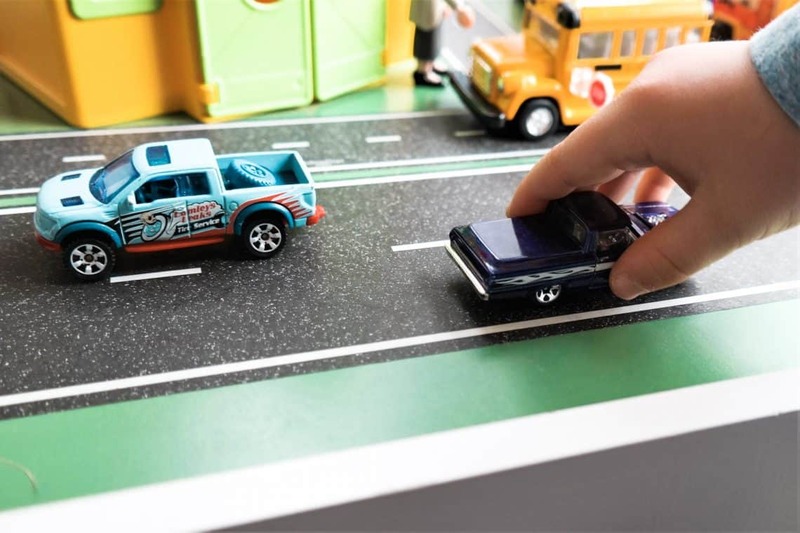 Your kid is also going to feel the need to talk over them in a near shout. Do sit near the wing of the plane if you’re potty training and being near the restroom is a priority. It will be close enough you can keep an eye out for an empty lavatory. Don’t choose an exit row. Children are not allowed to sit in exit rows and you will be moved and possibly separated. Do know that car seats may only be placed in middle or window seats and plan accordingly. Car seats do make it harder for the window person to exit the row so I try to be considerate of that. If you’re not a frequent flyer, you may not realize that while liquids are heavily regulated through TSA, dry foods are not! Which means you are free to load up your carry on (or personal item) with snacks for your kiddo. 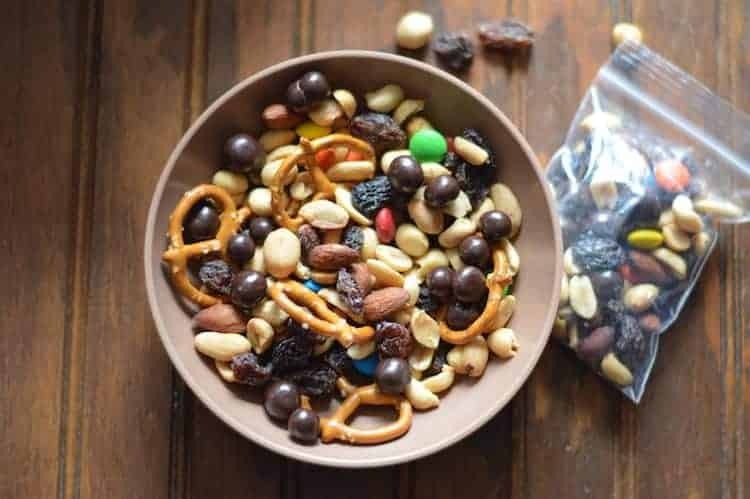 Crackers, pretzels, and trail mix are always a great option. Fruit snacks, fruit pouches, and a granola bar are some of our other go-to options. Last but not least, I always pack a lollipop. Sucking on objects can help equalize the pressure in your kid’s ears. It’s also the toddler equivalent of a pacifier. If your little one hasn’t been exposed to candy yet, a fruit or vegetable squeeze pouch works well too! When it comes to travel, electronics are a must for our family. Tablets, headphones and handheld gaming systems are a total life saver. If you don’t already know, Netflix has this great download feature that will allow you to download episodes and movies to watch offline. 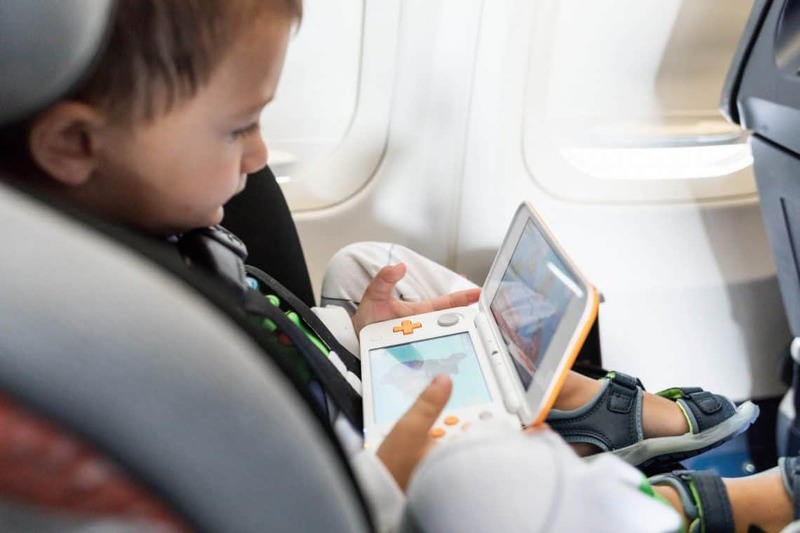 Load them up on your tablet before your flight. I try to do a mixture of tried and true favorites plus new content. On our last flight, we brought along our new Nintendo 2DS XL. My husband purchased one before his deployment this summer and both of our kids fell in love with the handheld gaming device. So, when I received the opportunity to review a unit for Nintendo, I jumped at the chance. With the amount of traveling we were doing this summer, between flights and road trips, I knew having two gaming systems would make my life easier – and I was right. It kept my toddler entertained the entire time he was awake during our flight. At almost 3 years old, Mario Kart Racing 7 is one of his favorite games and he played it until he passed out. Which is when I had a grade school flashback and broke out Pokemon Ultra Sun to pass the next hour and a half trying to catch them all. With two systems, my kids are even able to link up and play together. 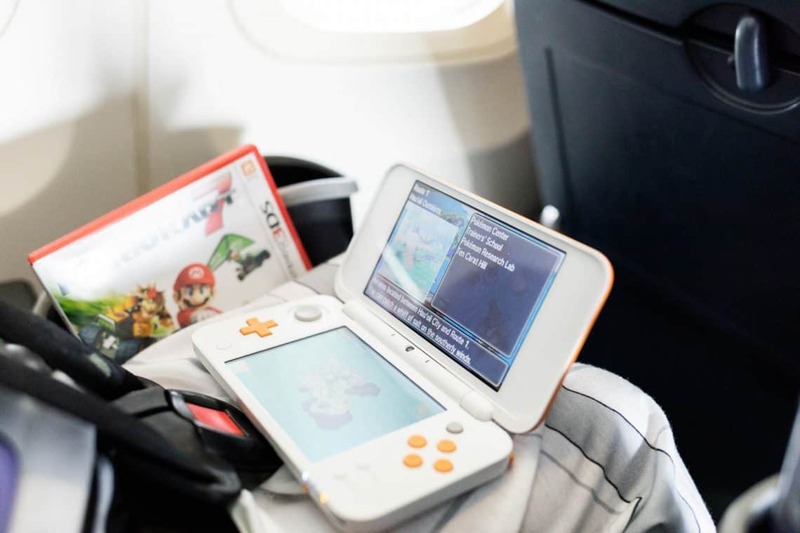 The Nintendo 2DS XL is definitely becoming one of our travel essentials. When you get to the airport or you’re stuck on a layover, it can be tempting to find the nearest chair and collapse with your devices. Instead, now is the time to get their wiggles out. I make sure all toys and electronics are put away and use the time to stretch, walk around a bit and if necessary, have a proper meal. By the time we’re ready for our next flight, the kids have released some of their energy and are ready to (hopefully) sit still….still enough to survive flying with a toddler, that is! Thank you to Nintendo for gifting me the device and games for purposes of this review. All opinions remain my own.